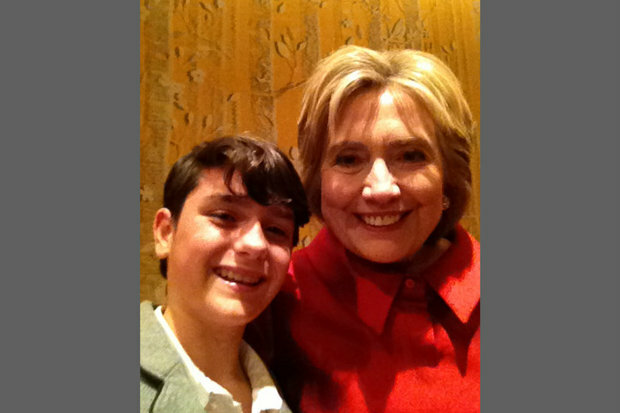 Olivia took a selfie with Hillary Clinton at the presidential candidate's birthday party. BROOKLYN — Want to know how to grab a selfie with Hillary Clinton at her birthday party? If you're a civic-minded 12-year-old feminist, all you need to do is offer to become the candidate's youngest campaign volunteer. Olivia, a middle schooler whose heartwarming letter to Clinton went viral after the campaign shared it on their website and on social media spoke with DNAinfo about how she got a chance to meet the presidential candidate and what she plans to do when she grows up. The mutual admiration began a few months ago, when the student at Brooklyn's Mary McDowell Friends School decided to write a letter to Clinton, she said in an interview Thursday with DNAinfo. "I am a huge fan of yours, and I really hope you become President. I am a little feminist growing up to help all women with equal rights," Olivia wrote in the letter. She asked her fathers, Dominic and Andy, to make sure the former Secretary of State receieved it, and after they emailed the letter to one of Clinton's staffers, they quickly got a response from the campaign, and even Clinton herself. Olivia was also featured in one of Clinton's campaign videos, "Join Women for Hillary." "I am so heartened to know that you are following current events and are interested in the future of our country," Clinton said in her reply to Olivia, whose initial letter drew 50,000 retweets on Twitter, along with a stream of likes on Facebook and Instagram. "Keep up the great work, always care deeply about what you believe in, and never stop reaching for the stars!" Dominic then bought tickets for Olivia, her brother and himself to attend the the Oct. 25 birthday party in NYC, which hosted celebrities including Amy Schumer, Demi Lovato and John Legend, he said. When the Clinton campaign found out they were coming, they decided to document the meeting. "Olivia may be actually speaking to the future president of the United States," Dominic recalled thinking. Olivia said she can relate to how hard Clinton has worked on her career and campaign. Olivia — who has dyslexia and attention deficit hyperactivity disorder — has to work extra hard as well to overcome her learning disabilities, she told DNAinfo. "I like that she doesn't really stop trying," she said. "I need to try a lot harder than a lot of others." A 12-year-old feminist named Olivia wrote Hillary this brave, heartwarming letter. Olivia 2040, anybody? Head of school Debbie Zlotowitz said she was pleased with the exchange. “For me, it was a culmination of what we hope to teach all our students,” she said. The school, Olivia says, is great because of its small class sizes, but in the letter she wrote that she wished there were more affordable public schools. "[Mary McDowell] is fairly expensive and I wish that there were more public schools that can help kids with Dyslexia like me." Olivia even offered in her letter to volunteer at Clinton's Brooklyn Heights headquarters and she "bets she would be the youngest member" of the campaign, but her dad Dominic pointed out that "she really is volunteering already" with videos and her support for Clinton. She eventually wants a career in politics — one that may even include a presidential run, as Clinton suggested — but before that happens she has other plans. "I have a whole big dream," she said. "I want to be a famous soccer player ... retire and then become a politician." But in the meantime, Olivia is focussing on Clinton's campaign and rooting for the possible first woman president of the United States. "If Hillary Clinton becomes president, she'll get a couple of things off my list," she said.